I frequently search Ebay and Etsy for trinkets that I think Kari will like (tolerate). My personal style is probably a little more eclectic than hers so I have to dial back. She frequently gives me the "you are so odd" or "you can put that up in YOUR office" look when I see something I really like. When looking for items to decorate the house I am amazed by the discrepancy in prices. I hold the idea that something is only worth what someone else is willing to pay, but sometimes I wonder how a "price" is determined. I recently bought a unique nesting hedgehog set made of brass that was titled "Hedgehog Stacking Ashtrays." I really love the aesthetic. Once it arrived I proceeded to display it on the beforementioned shelves in the bedroom. In a fit of boredom I thought I would see if there were variations in the design or similar sets. There are currently 2 sets of Hedgehog "stacking ashtrays" on Ebay for $249 and one for $298, and an incomplete set selling for $99. They were also labeled as being designed by Walter Bosse. So initially I thought I had stumbled on an amazing deal since I paid $13 for mine. The reality is that all these sets were copies of the original Walter Bosse designed bronze hedgehogs. Unfortunately the set I bought is a copy as well, or more accurately, one of many variations copying Walter Bosse's original design. Either way I love the hedgehogs and they sit on our shelf defying the Moshe's attempts to knock them off. The backstory to items like these are equally intriguing. 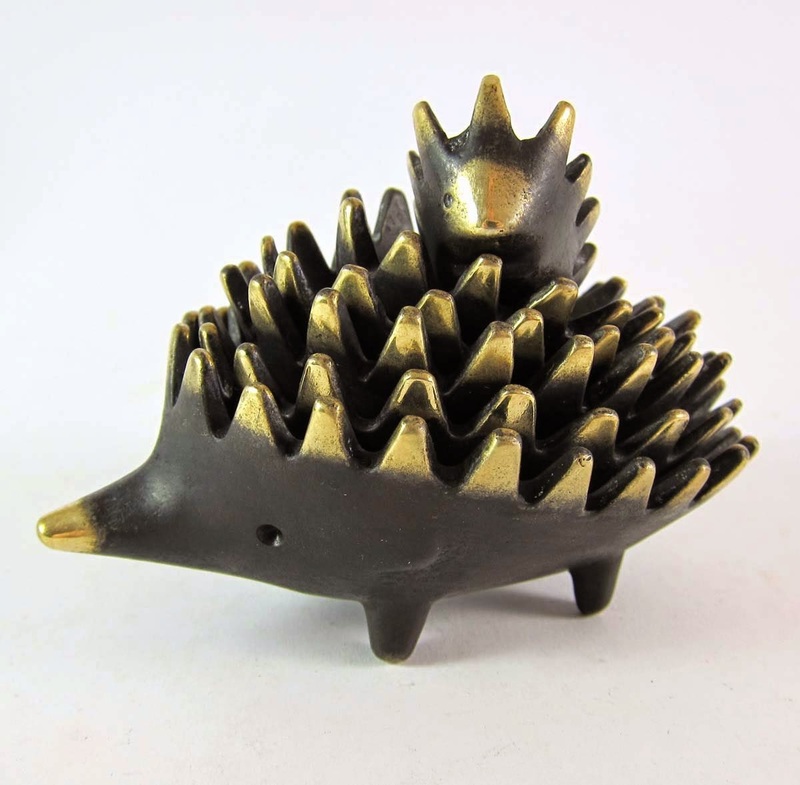 The hedgehogs were designed by Walter Bosse, an Austrian designer known for his modern Vienna Bronze figurines. Interestingly he died impoverished as a result of other artists copying his work, he spent years in court trying to receive royalties for his designs, as a result of his efforts he is considered the founder of modern copyright law for designer goods and handicrafts. When he passed, he was buried without a gravestone. Years later a consortium of collectors had a gravestone designed using his infamous hedgehogs for inspiration. The things you learn. I like them Micheal! Those are fantastic. And I feel educated after reading that post, double win! PS fun blog, and thanks for doing the digging on the h.hogs! Hey Running Rabbit! I'm pretty sure Micheal found sets that had all six. Maybe people used the big one so it was more likely to get lost? Thanks for reading! What a great buy!